Tick tock, tick tock, tick tock.That’s the sound of the countdown that begins each day of every week of every month. It’s the one aspect of sales that just never changes. And those two things often go hand-in-hand. While we (or our team) are racing to hit quota against that clock, though, we can save time and maximize our numbers by investing in the right processes, activities, and skills. Truth is, sales is changing — quickly. As the sales conversations grows even more buyer-focused, sales reps have begun developing his or her own hack, own technique, own process. That’s where this guide comes in. In this growing sales landscape, we’ll outline the various processes and key strategies for prospecting — the phase of selling that often consumes the most time and energy (and is the most crucial to get right). Prospecting: The process of searching for potential customers, clients, or buyers in order to develop new business. The end goal is to move prospects through the sales funnel until they eventually convert into revenue-generating customers. What’s the difference between leads and prospects? As the sales environment matures, we’re seeing a shift from the former method of prospecting (outbound) to one that is much more buyer-centric (inbound). Our world is now characterized by infinite information, whenever we want. It’s time they adopt inbound sales. Companies that use inbound sales techniques are better positioned for success in this new realm of buyer awareness. In fact, 64% of teams that use inbound selling reach their quotas as opposed to 49% of sales teams who use outbound sales. IBM even increased their sales by 400% after implementing their inbound sales program. Takeaway: Prioritize customers based on the size of the opportunity or their potential lifetime value. Takeaway: Keep a working list of influencers and buyers, perhaps mapped out by the organizational structure of the organization. We’ll use this list later when we’re in the outreach phase of prospecting. There are a bazillion sales qualification frameworks. At HubSpot, the reps have coined the GPCTBA/C&I framework (which they vouch sounds more confusing than it actually is). Let’s break down the qualifying dimensions used in our list above (and any additional relevant dimensions) into percentages between 1% and 100% based on how important they are to the sales process. For example, size of the opportunity is probably more important to us than timing in terms of closing a deal so it would receive a 70% whereas timing would receive a 5%. Add up these dimension scores until each prospect has a total score. And now our entire list is prioritized. If we want to get more high-level with our prep, we can create a decision map to outline our prospect’s options and end-goals. This will help us better handle any objections and personalize a pitch that resonates with their primary objectives. We could also conduct a competitive analysis to determine how we can better position our company’s service or product within the industry and how we can combat prospects’ objections. Kyle Van Pelt devised a systematic approach for prospecting where he reads 30 articles in 30 minutes every day and uses the content in his email outreach in a tailored, relevant way. And he achieved a 90% response rate. Be human. No one likes to communicate with a professional robot. Adding in details like wishing someone a happy holiday weekend or by conveying how awesome their company’s product is are real touches that allow us to establish a connection on a deeper level. Help, don’t sell. Provide value and ask for nothing in return. This process isn’t about us, it’s about THEM. For example, instead of scheduling a follow-up meeting, we could offer to conduct an audit on their digital media presence and get back to them with our findings in a week. Keep it casual. Remember that this is just a conversation. Stay natural and as non-salesy as possible. The key to prospecting and sales is that we’re never selling. We’re simply determining if both parties could mutually benefit from a relationship. Batch prospecting sessions for 2-3 hours at a time and take a quick five-minute break between each hour. Get an egg timer, and set the timer on a countdown for 20 minutes, 30 minutes, or 45 minutes, depending on how much time we scheduled for the call. End the call on the timer’s beep, use 5 minutes for following up, 5 minutes for updating notes and administrative tasks in Salesforce, and then use 5 minutes to prep for the next call. Creating a connection: Now we have to make the connection. In our opening, they learn why we’re reaching out to them, but now they need to know why they should care about what we do. 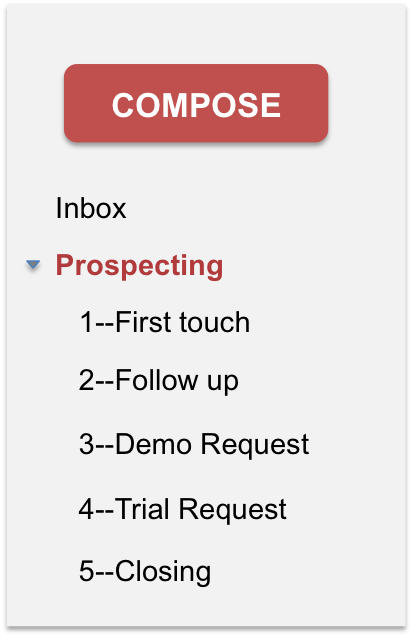 One of HubSpot’s sales managers uses Gmail labels to visualize his prospects in the sales funnel. HubSpot’s free CRM allows users to keep track of sales activity and source new prospects. How to use it: Surface warm prospects who have already visited our website. Store contacts and companies, track deals and easily manage tasks such as follow-ups and meetings. Connects the web apps we use to automate tedious tasks. How to use it: Create a “Zap” to automatically send a text message whenever we receive a new email. Or, automatically create a new lead in Salesforce when we get an email submission on our blog. Use email tracking to know when prospects open emails, click on links, or open attachments. HubSpot Sales also provides us with detailed contact information right in our inbox and it allows us to schedule emails to be sent at a time when we know our prospect will be most likely to open them.